NDN application for sending out Interest packets. Size of this type is 664 bytes (on a 64-bit architecture). Definition at line 49 of file ndn-consumer.hpp. Definition at line 96 of file ndn-consumer.hpp. Definition at line 97 of file ndn-consumer.hpp. Default constructor Sets up randomizer function and packet sequence number. Definition at line 81 of file ndn-consumer.cpp. Definition at line 59 of file ndn-consumer.hpp. Definition at line 48 of file ndn-consumer.cpp. References GetRetxTimer(), m_interestLifeTime, m_interestName, m_seq, ns3::ndn::MakeNameAccessor(), ns3::ndn::MakeNameChecker(), and SetRetxTimer(). Method that will be called every time new Data arrives. Reimplemented in ns3::ndn::ConsumerPcon, and ns3::ndn::ConsumerWindow. Definition at line 213 of file ndn-consumer.cpp. References ns3::ndn::App::m_active, m_rtt, and ns3::ndn::App::OnData(). Referenced by ns3::ndn::ConsumerWindow::OnData(), and ns3::ndn::ConsumerPcon::OnData(). Method that will be called every time new Nack arrives. Definition at line 256 of file ndn-consumer.cpp. References ndn::lp::Nack::getInterest(), ndn::Interest::getName(), ndn::lp::Nack::getReason(), and ns3::ndn::App::OnNack(). Definition at line 266 of file ndn-consumer.cpp. Referenced by CheckRetxTimeout(), ns3::ndn::ConsumerWindow::OnTimeout(), and ns3::ndn::ConsumerPcon::OnTimeout(). Definition at line 159 of file ndn-consumer.cpp. References ns3::ndn::App::m_active, ns3::ndn::App::m_appLink, ns3::ndn::App::m_face, m_interestLifeTime, m_interestName, m_rand, m_seq, m_seqMax, ns3::ndn::App::m_transmittedInterests, ns3::ndn::AppLinkService::onReceiveInterest(), ScheduleNextPacket(), and WillSendOutInterest(). Referenced by ns3::ndn::ConsumerCbr::ScheduleNextPacket(), ns3::ndn::ConsumerBatches::ScheduleNextPacket(), and ns3::ndn::ConsumerWindow::ScheduleNextPacket(). The reason for "before" even is that in certain cases (when it is possible to satisfy from the local cache), the send call will immediately return data, and if "after" even was used, this after would be called after all processing of incoming data, potentially producing unexpected results. Definition at line 280 of file ndn-consumer.cpp. Referenced by SendPacket(), and ns3::ndn::ConsumerWindow::WillSendOutInterest(). Called at time specified by Start. Definition at line 136 of file ndn-consumer.cpp. Called at time specified by Stop. Definition at line 147 of file ndn-consumer.cpp. Implemented in ns3::ndn::ConsumerZipfMandelbrot, ns3::ndn::ConsumerWindow, ns3::ndn::ConsumerBatches, and ns3::ndn::ConsumerCbr. Referenced by OnTimeout(), SendPacket(), and StartApplication(). Checks if the packet need to be retransmitted becuase of retransmission timer expiration. Definition at line 111 of file ndn-consumer.cpp. References m_retxEvent, m_retxTimer, m_rtt, and OnTimeout(). Modifies the frequency of checking the retransmission timeouts. Definition at line 92 of file ndn-consumer.cpp. References CheckRetxTimeout(), m_retxEvent, and m_retxTimer. Returns the frequency of checking the retransmission timeouts. Definition at line 105 of file ndn-consumer.cpp. Definition at line 135 of file ndn-consumer.hpp. Referenced by ns3::ndn::ConsumerZipfMandelbrot::SendPacket(), and SendPacket(). Definition at line 137 of file ndn-consumer.hpp. Referenced by GetTypeId(), ns3::ndn::ConsumerZipfMandelbrot::SendPacket(), and SendPacket(). Definition at line 138 of file ndn-consumer.hpp. Referenced by ns3::ndn::ConsumerCbr::ConsumerCbr(), ns3::ndn::ConsumerCbr::GetTypeId(), ns3::ndn::ConsumerZipfMandelbrot::SendPacket(), and SendPacket(). EventId of pending "send packet" event. Definition at line 139 of file ndn-consumer.hpp. 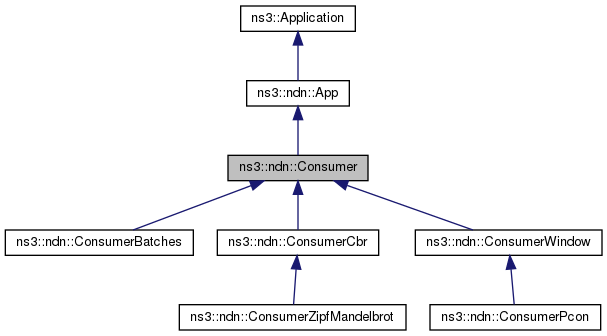 Referenced by ns3::ndn::ConsumerCbr::ScheduleNextPacket(), ns3::ndn::ConsumerBatches::ScheduleNextPacket(), ns3::ndn::ConsumerWindow::ScheduleNextPacket(), ns3::ndn::ConsumerZipfMandelbrot::ScheduleNextPacket(), and StopApplication(). Definition at line 140 of file ndn-consumer.hpp. Referenced by CheckRetxTimeout(), GetRetxTimer(), and SetRetxTimer(). Event to check whether or not retransmission should be performed. Definition at line 141 of file ndn-consumer.hpp. Referenced by CheckRetxTimeout(), and SetRetxTimer(). Definition at line 143 of file ndn-consumer.hpp. Referenced by CheckRetxTimeout(), Consumer(), OnData(), OnTimeout(), ns3::ndn::ConsumerBatches::ScheduleNextPacket(), ns3::ndn::ConsumerWindow::ScheduleNextPacket(), ns3::ndn::ConsumerZipfMandelbrot::SendPacket(), and WillSendOutInterest(). Definition at line 145 of file ndn-consumer.hpp. Definition at line 146 of file ndn-consumer.hpp. Definition at line 147 of file ndn-consumer.hpp. Referenced by GetTypeId(), and SendPacket().